ESG investments are on the rise—that is, when investors not only consider financial analysis in making investment decisions, but also non-financial information related to the environment, society, and governance, in order to conduct investment which promotes companies’ sustainable growth from a mid-to long-term perspective (sustainability). The following showcases some of the high performance evaluations which Sojitz has received from external organizations. Since 2004, RobecoSAM has assessed the corporate sustainability of roughly 3,000 major companies worldwide, awarding “Gold Class,” “Silver Class,” and “Bronze Class” awards to the best companies in each industry sector. Sojitz was selected for a Silver Class Sustainability Award in 2019. We also received the “Industry Mover” award for the second year running, which recognizes Sojitz as having made the most improvement among companies in our sector over that year. CDP is a non-profit organization based in London and jointly run by institutional investors. CDP collects data from major companies across the world regarding environmental strategies and countermeasures against greenhouse gases emitted by these companies. CDP then analyzes this data and announces the results each year. In 2018, Sojitz received an upper rating of B in “Management” with regards to climate change. This award, conferred jointly by the Tokyo Stock Exchange and the Ministry of Economics, Trade, and Industry each year, recognizes listed companies which excelled at empowering women in the workplace. Sojitz has been selected as a Nadeshiko Brand company for three consecutive years (March 2017 , March 2018 and March 2019), in recognition for our efforts to promote women’s empowerment in terms of career advancement and support for working mothers. Sojitz Corporation (“Sojitz”) was selected as an FY2018 constituent of the Dow Jones Sustainability Indices’ (DJSI) DJSI World and DJSI Asia Pacific listings, both internationally-recognized, CSR investment-focused global stock price indices. The DJSI is a family of stock indices provided by S&P Dow Jones Indices LLC (U.S.) and RobecoSAM (Switzerland). DJSI evaluates companies for selection as constituents based on those companies’ economic, environmental, and social performance in terms of sustainability. 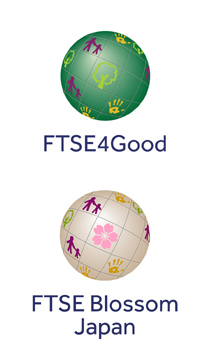 In June 2018, Sojitz was selected as a constituent of the FTSE4 Good Index Series and FTSE Blossom Japan Index provided by FTSE Russell*1, a global index provider. These are both widely used by investors, as indexes comprised of companies which excel in their response to environmental, social, and governance (ESG) issues. The FTSE Blossom Japan Index has also been selected by the Government Pension Investment Fund (GPIF) as an index for ESG investment. *1 Fully-owned subsidiary of the London Stock Exchange. Creates and manages indexes, as well as provides related financial data on a global scale. "FTSE Russell confirms that Sojitz has been independently assessed according to the index criteria, and has satisfied the requirements to become a constituent of the FTSE Blossom Japan Index. Created by the global index and data provider FTSE Russell, the FTSE Blossom Japan Index is designed to measure the performance of companies demonstrating strong Environmental, Social and Governance (ESG) practices. The FTSE Blossom Japan Index is used by a wide variety of market participants to create and assess responsible investment funds and other products." 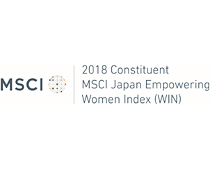 Sojitz was selected as a constituent of the MSCI Japan Empowering Women Index (WIN) in 2017 and 2018. This index was created by U.S. company MSCI and is another ESG index selected by the GPIF for ESG investment. Index figures are calculated using data disclosed under the Act on Promotion of Women’s Participation and Advancement in the Workplace, with constituents comprised of those companies which earn a high gender diversity score. The inclusion of Sojitz in any MSCI Index, and the use of MSCI logos, trademarks, service marks or index names herein, do not constitute a sponsorship, endorsement or promotion of Sojitz by MSCI or any of its affiliates. The MSCI indexes are the exclusive property of MSCI. MSCI and the MSCI index names and logos are trademarks or service marks of MSCI or its affiliates. 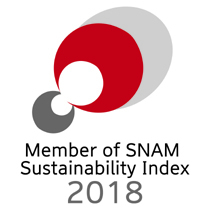 Sojitz has been a constituent of the SNAM Sustainability Index, an index set up by Sompo Japan Nipponkoa Asset Management Co., Ltd, for six years running. The SNAM Sustainability Index was first established in August 2012, and it evaluates nominees’ ESG (response to environmental, social, and governance issues) based on Sompo Risk Management & Health Care Inc.’s environmental survey and IntegreX Inc’s social and governance survey.